Plan your winter holiday now with Pegasus’ affordable fares. 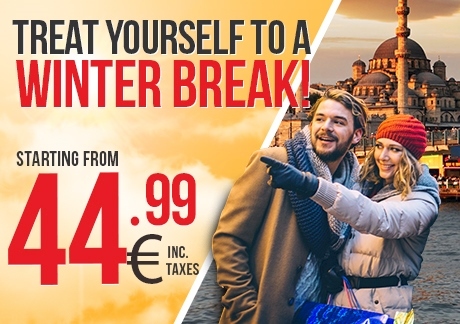 Book your flights on www.flypgs.com/en or via Pegasus’ mobile channels before 11 October to travel to Turkey and other Pegasus destinations between 1 December 2015 and 26 March 2016 with fares starting at just €44.99! a. Campaign is valid for routes stated below. b. Travel Dates: 1 December 2015-26 March 2016. Dates stated below are not included in the campaign. e. This discounted price is only available for 185.000 number of seats. f. This discounted price is only available for direct and one way flights purchased on flypgs and mobile channels. i. There is a check-in fee of minimum 8 USD on international routes and 7TL on domestic routes payable for every passenger and every flight segment (flight number). This fee may change due to countries and routes.